Benetti has released pictures and details on Panthera, a 47m superyacht, part of the twelve motor yachts delivered this year by the Italian yard. Previously known as hull number FB502, Panthera is the second yacht in the 500s series, introduced in 2010 with the superyacht Imagination. But she’s easily recognisable from her sister thanks to her silver metallic paint job. ABS classed and MCA compliant, Panthera is entirely built in aluminium to a design by the in-house team. Her atypical profile makes her a fast and comfortable yacht while underway, with a low level of noise and vibration. The modern interior was closely developed by the in-house designers and the owner. 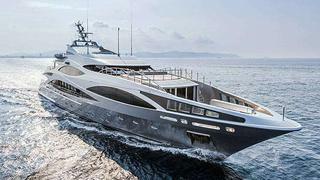 Panthera accommodates 10 guests in five cabins. The master suite is forward on the main deck and enjoys a panoramic view. plus a private exterior lounge on the foredeck. Three other guest staterooms are on the lower deck, including a full-beam VIP, while the other VIP is on the bridge deck. The efficient naval architecture of Panthera combined with twin 2,880kW MTU engines allow high performance with a top speed of 24 knots and a cruising speed of 22 knots. With a displacement of only 340 tons, she reaches a range of 3,200 nautical miles at 12 knots. Benetti is already working on the third hull (FB503) in this series due to be delivered in 2014.